This article is about the company. For the town, see Alcoa, Tennessee. For the river, see Alcoa River. For other uses, see Alcoa (disambiguation). Alcoa Corporation (from Aluminum Company of America) is an American industrial corporation. It is the world's eighth largest producer of aluminum, with corporate headquarters in Pittsburgh, Pennsylvania. Alcoa conducts operations in 10 countries. Alcoa is a major producer of primary aluminum, fabricated aluminum, and alumina combined, through its active and growing participation in all major aspects of the industry: technology, mining, refining, smelting, fabricating, and recycling. On November 1, 2016, Alcoa Inc. split into two new entities: Alcoa Corporation, which is engaged in the mining and manufacture of raw aluminium, and Arconic, which processes aluminum and other metals. Alcoa moved its headquarters back to Pittsburgh effective September 1, 2017. In October 2018, Alcoa announced plans to move from Pittsburgh's North Shore to a more downtown Pittsburgh location. In 1886, Charles Martin Hall, a graduate of Oberlin College, discovered the process of smelting aluminium, almost simultaneously with Paul Héroult in France. He realized that by passing an electric current through a bath of cryolite and aluminium oxide, the then semi-rare metal aluminium remained as a byproduct. This discovery, now called the Hall-Héroult process, is still the only process used to make aluminium (however, see also Bayer process). 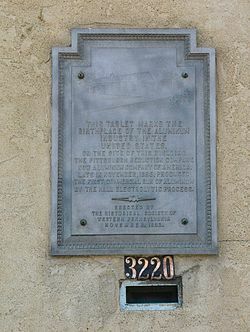 A tablet marking where in November 1888, the Pittsburgh Reduction Company, now Aluminum Company of America, produced the first commercial run of aluminium by the Hall Electrolytic Process. Tablet installed by Historical Society of Western Pennsylvania in 1938. Probably fewer than ten sites in the United States and Europe produced any aluminium at the time. In 1887, Hall made an agreement to try his process at the Electric Smelting and Aluminum Company plant in Lockport, New York, but it was not used and Hall left after one year. On Thanksgiving Day 1888, with the help of Alfred E. Hunt, he started the Pittsburgh Reduction Company with an experimental smelting plant on Smallman Street in Pittsburgh, Pennsylvania. In 1891, the company went into production in New Kensington, Pennsylvania. In 1895, a third site opened at Niagara Falls. By about 1903, after a settlement with Hall's former employer, and while its patents were in force, the company was the only legal supplier of aluminium in the United States. By 1902 New Kensington consisted of 173,000 sq. feet on 15 acres with 276 employees and the company operated hydropower and reduction plants in Niagara Falls, NY (1895), Shawinigan Falls, Quebec (1900), mining operations in Bauxite, AR (1901) and reduction facilities in East St. Louis, IL (1902). "The Aluminum Company of America" became the firm's new name on January 1, 1907. The acronym "Alcoa" was coined in 1910, given as a name to two of the locales where major corporate facilities were located (although one of these has since been changed), and in 1999 was adopted as the official corporate name. From 1902 until 1915 additional plants in Massena, NY (1903), Alcoa, TN (1911), Edgewater, NJ (1915), Badin, NC (1915) came online while New Kensington had 31 buildings in the complex housing six departments (tubes, sheets, rods, bar and wire, extrusion, jobbing, foil) and two subsidiaries (Aluminum Cooking Utensil Company and Aluminum Seal Company). In 1907 it created the "company town" of Pine Grove, New York, for workers outside Massena. In Baden, Alcoa, Maryville and elsewhere the company funded the construction of schools, parks, playgrounds and medical facilities. By the end of World War I Alcoa's New Kensington facility accounted for 3,292 workers—a fifth of the local population—and covered over 1 million square feet of manufacturing space on 75 acres. Alcoa purchased an 8% stake of Aluminium Corporation of China (Chalco) in 2001. It tried to form a strategic alliance with China's largest aluminium producer, at its Pingguo facility; however, it was unsuccessful. Alcoa sold their stake in Chalco on September 12, 2007, for around $2 billion. In 2004, Alcoa's specialty chemicals business was sold to two private equity firms led by Rhône Group for an enterprise value of $342 million, which included the assumption of debt and other unfunded obligations. Rhône Group then changed the name to Almatis, Inc. In 2005 Alcoa acquired two major production facilities in Russia, at Samara and Belaya Kalitva. In 2005, Alcoa began construction in Iceland on Alcoa Fjarðaál, a state-of-the-art aluminium smelter and the company's first greenfield smelter in more than 20 years, albeit under heavy criticism by local and international NGOs related to a controversial dam project exclusively dedicated to supplying electricity to this smelter. Also, Alcoa has completed or is undergoing primary aluminium expansion projects in Brazil, Jamaica, and Pinjarra, Western Australia. In 2006, Alcoa relocated its top executives from Pittsburgh to New York City. Although the company's principal office is located in New York City, the company's operational headquarters are still located at its Corporate Center in Pittsburgh. Alcoa employs approximately 2,000 people at its Corporate Center in Pittsburgh and 60 at its principal office in New York. Alcoa was named one of the top three most sustainable corporations in the world at the World Economic Forum in Davos, Switzerland. On May 8, 2008, Klaus Kleinfeld was appointed CEO of Alcoa, succeeding Alain Belda. On April 23, 2010, Alcoa's board of directors selected Kleinfeld to the office of chairman, following Belda's planned retirement. On July 16, 2012, Alcoa announced that it would take over full ownership and operation of Evermore Recycling and make it part of Alcoa's Global Packaging group. Evermore Recycling is a leader in used beverage can recycling, purchasing more recycled cans than any other group worldwide. In June 2013, Alcoa announced it would permanently close its Fusina primary aluminium smelter in Venice, where production had been curtailed since June 2010. On January 9, 2014, Alcoa reached a settlement with the U.S. Securities and Exchange Commission and the U.S. Department of Justice over charges of bribing Bahraini officials. Under the terms of the settlement they will pay the SEC $175 million to settle the charges. To settle the criminal claims with the DoJ, Alcoa World Alumina (AWA, a company within Alcoa World Alumina and Chemicals) is pleading guilty to one count of violating the anti-bribery provisions of the Foreign Corrupt Practices Act (FCPA). AWA will pay the DoJ $223 million in five equal installments over the next four years, bringing the company's total bill for the scandal to $384 million. In June 2016, Alcoa announced plans to split itself into two companies. A new company, Arconic, would take over the business of designing and building processed metal parts, primarily for the automotive and aerospace industries, while the Alcoa name would be remain on a company that continued the mining, smelting, and refining of raw aluminium. The split was completed on November 1. In April 2017, Alcoa announced that it would relocate its corporate headquarters back to Pittsburgh as part of a general consolidation of administrative facilities around the world. The Political Economy Research Institute ranks Alcoa 15th among corporations emitting airborne pollutants in the United States. The ranking is based on the quantity (13 million pounds in 2005) and toxicity of the emissions. In April 2003, Alcoa Inc. agreed to spend an estimated $330 million to install a new coal-fired power plant with state-of-the-art pollution controls to eliminate the vast majority of sulfur dioxide and nitrogen dioxide emissions from the power plant at Alcoa's aluminium production facility in Rockdale, Texas. The settlement was the ninth case the Bush administration pursued to bring the coal-fired power plant industry into full compliance with the Clean Air Act. Alcoa was unlawfully operating at the Rockdale facility since it overhauled the Rockdale power plant without installing necessary pollution controls and without first obtaining proper permits required by "New Source Review" program of the Clean Air Act. In February 1999, Alcoa cleaned soils and sediment contaminated with polychlorinated biphenyls (PCB) and lead at the York Oil federal Superfund site in Moira, New York, in accordance with the Environmental Protection Agency. The site, a former waste oil recycling storage facility, accepted waste oil from a number of companies, including Alcoa. The facility was improperly managed and operated and, as a result, soils on the York Oil Property and nearby wetlands sediments and groundwater were contaminated. The United States Environmental Protection Agency (EPA) issued a Superfund Unilateral Order on December 31, 1998, requiring Alcoa to excavate, treat and dispose of the contaminated wetlands sediments. Alcoa formed the Alcoa Minerals of Jamaica subsidiary on the island in 1959, shipping their first load of bauxite in 1963 from Rocky Point. Later in 1972, Alcoa established a 500,000 metric tonne per year refinery where they process bauxite into alumina. They have continued to upgrade the plant through the years and its now capable 1,425,000 metric tonnes per year. In 1988 the Jamaican government gained a 50% share in the subsidiary and renamed the operation to Jamalco, Alcoa being the managing partner. Expansion of the operation in 2007 resulted in Alcoa owning a total of 55% of the operation. Alcoa continues to mine bauxite in the Jamaican parishes of Clarendon and Manchester while competitors' operations take place in nearby parishes. Alcoa's affiliate in Ghana, the Volta Aluminium Company, was completely closed between May 2003 and early 2006, due to problems with its electricity supply. Alcoa is a major owner of the fr:Compagnie des bauxites de Guinée through Halco Mining, together with Rio Tinto Alcan and the Guinean government. Guinea is the second global producer of bauxite and it is said to have half of the world's reserves. The Fjardaál smelter in eastern Iceland was completed in June 2007, and brought into full operation the following April. The plant processes 940 tons of aluminium a day, with a capacity of 346,000 metric tons a year, making it Alcoa's second largest capacity smelter. For power, the plant relies on the Kárahnjúkar Hydropower Plant, constructed and operated by the state owned Landsvirkjun specifically for the smelting operation. That project was subject to controversy due to its impact on the environment. In 2006, Alcoa and the government of Iceland signed an agreement on instigating a thorough feasibility study for a new 250,000 tpy (Tons Per Year) smelter in Bakki by Húsavík in Northern Iceland. In October 2011, the proposed project was dropped because "the power availability and proposed pricing would not support an aluminum smelter". Alcoa announced plans to close the office in Reykjavik. On November 21, 2006, Alcoa announced that it planned to close the Waunarlwydd works in Swansea, with the loss of 298 jobs. Production ceased at the Swansea plant on January 27, 2007. A small site closure team worked at the site until December 31, 2008. The site is still owned by Alcoa, but is now managed locally and renamed, Westfield Industrial Park. Several of the large buildings are leased out to local businesses. Alcoa operates bauxite mines, alumina refineries and aluminium smelters through Alcoa World Alumina and Chemicals, a joint venture between Alumina Limited and Alcoa. Alcoa operates two bauxite mines in Western Australia—the Huntly and Willowdale mines. Alcoa World Alumina and Chemicals owns and operates three alumina refineries in Western Australia: Kwinana, Pinjarra, and Wagerup. The Wagerup expansion plans have been put on hold due to the Global Financial Crisis. Two aluminium smelters are also operated in the state of Victoria at Portland and Point Henry; the Point Henry smelter was scheduled to be closed in August 2014. Alcoa Australia Rolled Products, a 100% Alcoa Inc. venture, operates two rolling mills. The Point Henry Rolling mill in Victoria and the Yennora rolling mill in N.S.W. have a combined rolling capacity of approx. 200,000 tonnes. Alcoa uses 12,600 GWh or 15% of Victoria's electricity annually. Alcoa's Western Australian Wagerup plant has a troubled history in the context of claims that pollution from the plant has had an adverse impact on the health of members of the adjacent local community. On January 3, 2003, Alcoa opened its new operations headquarters on the North Shore of Pittsburgh. This move came about after it donated its 50-year-old skyscraper headquarters in Downtown Pittsburgh to the Regional Development Authority. Alcoa created a plant just outside Maryville in Blount County, Tennessee. To support the factory, Alcoa built a small city and named it as such. The Alcoa Tenn Federal Credit Union was the first employee created credit union in the state. The plant is no longer an Alcoa business. Alcoa had a smelting plant in Badin, North Carolina from 1917 to 2007 and continued a hydroelectric power operation there until February 1, 2017 when the Yadkin Hydroelectric Project was sold to Cube Hydro. Alcoa maintains several Research and Development Centers in the United States. The largest one, Alcoa Technical Center, is located East of its Pittsburgh Headquarters at Alcoa Center, Pennsylvania. The "Tech Center" is as large as some college campuses, has its own zip code and maintains an extensive intellectual and physical resource for innovation. Alcoa's extensive safety program continuously improves safety at the Tech Center. After Paul O'Neill became Alcoa CEO in 1987, Alcoa became one of the safest companies in the world, despite the aluminium industry's inherent risks. Alcoa plans to close offices in Richmond, Virginia; Nashville, Tennessee; and Chicago. Alcoa is portrayed as the main sponsor of the CBS' 1953 program See It Now in George Clooney's Academy Award–nominated film Good Night, and Good Luck. ^ a b c d e f "Alcoa Corporation 2017 Annual Report (Form 10-K)". sec.gov. U.S. Securities and Exchange Commission. January 2018. ^ "The world's leading primary aluminium producing companies in 2017". Statista. 2018. Retrieved 2018-11-18. ^ "Alcoa". Fortune. Retrieved 2018-11-25. ^ a b "Almy mom coa Inc 2011 Annual Report, Form 10-K, Filing Date Feb 16, 2012" (PDF). secdatabase.com. Retrieved June 25, 2012. ^ "Alcoa, Form 8-K, Current Report, Filing Date May 7, 2007" (PDF). secdatabase.com. Retrieved January 3, 2013. ^ "Alcoa, Form SC TO-T/A, Filing Date Jul 12, 2007". secdatabase.com. Retrieved January 3, 2013. ^ a b "Alcoa Completes Corporate Split". Aluminium Insider. November 2, 2016. Retrieved April 19, 2017. ^ a b Press, The Associated (April 20, 2017). "Alcoa moving headquarters back to Pittsburgh". WTAE. Retrieved 2017-04-20. ^ Belko, Mark (31 October 2018). "Alcoa considering a move from its North Shore home". Pittsburgh Post-Gazette. Retrieved 4 January 2019. ^ Hachez-Leroy, Florence (2006). "Aluminium industry: a Heritage for Europe" (PDF). Proceedings, TICCIH Congress. Archived from the original (PDF) on November 27, 2007. Retrieved November 3, 2007. ^ Rosenbaum, David Ira (1998). Market Dominance: How Firms Gain, Hold, or Lose It and the Impact on Economic Performance. Praeger Publishers via Greenwood Publishing Group. p. 56. ISBN 0-275-95604-0. Archived from the original on November 14, 2007. Retrieved 2007-11-03. ^ "Alcoa, Form 10-K, Annual Report, Filing Date Mar 5, 2002". secdatabase.com. Retrieved January 3, 2013. ^ "News: News Releases: Alcoa Sells Its Stake in Chalco; Will Continue Its Commitment to Chinese Aluminium Industry". Alcoa. September 12, 2007. Retrieved 2010-07-13. ^ "Alcoa, Form 8-K, Current Report, Filing Date Sep 12, 2007" (PDF). secdatabase.com. Retrieved January 3, 2013. ^ "Alcoa, Form 10-Q, Quarterly Report, Filing Date Apr 23, 2004" (PDF). secdatabase.com. Retrieved January 3, 2013. ^ "Alcoa, Form 10-K, Annual Report, Filing Date Feb 18, 2005" (PDF). secdatabase.com. Retrieved January 3, 2013. ^ "Alcoa, Form 8-K, Current Report, Filing Date Oct 8, 2004". secdatabase.com. Retrieved January 3, 2013. ^ Boselovic, Len (February 27, 2006). "Alcoa's HQ relocation to NYC no big surprise". Post-gazette.com. Retrieved 2010-07-13. ^ "Alcoa, Form 8-K, Current Report, Filing Date Mar 22, 2005" (PDF). secdatabase.com. Retrieved January 3, 2013. ^ "Alcoa, Form 8-K, Current Report, Filing Date Oct 11, 2005" (PDF). secdatabase.com. Retrieved January 3, 2013. ^ "Alcoa, Form 8-K, Current Report, Filing Date May 13, 2008" (PDF). secdatabase.com. Retrieved January 3, 2013. ^ "Alcoa, Form 8-K, Current Report, Filing Date Apr 27, 2010". secdatabase.com. Retrieved January 3, 2013. ^ "Alcoa Takes Full Ownership of Evermore Recycling". BrightWire. Archived from the original on 2013-01-18. ^ "Alcoa Reaches Settlement With SEC And DOJ Over Bahraini Bribery Scandal". Forbes. January 9, 2014. ^ "Alcoa Details Plans to Split into Two Companies". The Wall Street Journal. June 29, 2016. Retrieved April 19, 2017. ^ "Alcoa to Close New York Headquarters and Seven Other Offices". The Wall Street Journal. April 19, 2017. Retrieved April 19, 2017. ^ "Political Economy Research Institute – Toxic 100". Peri.umass.edu. Archived from the original on July 27, 2010. Retrieved 2010-07-13. ^ "U. S. Announces Clean Air Act Coal-fired Power Plant Settlement with Alcoa – Settlement Will Reduce Nitrogen Oxide and Sulfur Dioxide Emissions from Facility by More than 90 P". Yosemite.epa.gov. Retrieved 2010-07-13. ^ "Alcoa To Carry Out EPA's Order and Expand Cleanup at Superfund Site in Moira, New York To Contaminated Wetlands Sediments | Newsroom | US EPA". Yosemite.epa.gov. Retrieved 2010-07-13. ^ "Alcoa in Ghana: News: News From Ghana: Alcoa, Government of the Republic of Ghana Agree to Re-Start Valco Smelter". Alcoa.com. August 4, 2005. Retrieved 2010-07-13. ^ "Alcoa -- Guinea". www.alcoa.com. Retrieved May 2, 2018. ^ "Alcoa -- Iceland". www.alcoa.com. Retrieved May 2, 2018. ^ Eade, Christine (April 18, 2008). "Alcoa sells vacant factory for £13m | Markets – print". Property Week. Retrieved 2010-07-13. ^ "Knight Frank Commercial Search UK: Logistics & Industrial". ^ "Alcoa announces closure of Port Henry aluminium smelter". The Age. February 18, 2014. Retrieved 2014-02-18. ^ "Smelter power deals". The Age. March 2, 2010. Retrieved 2013-03-06. ^ "Alcoa says health complaints 'unfounded'". Australian Broadcasting Corporation – ABC News. December 6, 2009. Retrieved 2009-12-24. ^ Erickson, Melissa. "ALCOA unveils new company's name: Arconic". Retrieved March 16, 2016. ^ "About Badin Works". Archived from the original on March 15, 2010. Retrieved March 2, 2010. ^ "Alcoa Online Newsroom -". www.alcoa.com. Retrieved May 2, 2018.